After graduating I completed a six month internship at Plymouth Arts Centre. It was a huge learning curve, which included having to ring my Dad up and ask how I use a cafetiere – because I didn’t drink coffee and certainly didn’t want to look incompetent in front of my employers. Apart from winging making coffees, I supported the Curator and Assistant Curator on all aspects of exhibition planning and development which was incredibly insightful. The internship was two days a week and unpaid, so I worked two other jobs in order to support myself which was tough, but an incredibly valuable experience as It confirmed my passion for pursuing a career in this field, and it helped towards securing a place on the Contemporary Curating masters at Manchester Metropolitan University the following year. During my masters I threw myself into all opportunities available which could help towards building on my experience and job prospects. This included coordinating Pavement Gallery, an exhibition space housed in a former drapery store; the window space, which couldn’t be entered by the public, provided a highly visible stage for the display of international contemporary art which included work by David Batchelor, Martin Creed, and Mark Titchner. After completing the masters, I applied for a year long internship at the Holden Gallery, part of the Manchester School of Art. I have since been working as the Assistant Curator for the past four years. I have worked with the curator to devise and project manage seventeen exhibitions to date, programming and delivering thematic group exhibitions showing a wealth of major international contemporary artists including Liam Gillick, Douglas Gordon, Jonathan Monk, Laure Prouvost, Jenny Holzer, and Cornelia Parker. I have been focused on what I wanted to do since the internship at Plymouth Arts Centre. I learnt the importance of gaining as much experience as possible, paid or unpaid, especially whilst studying. 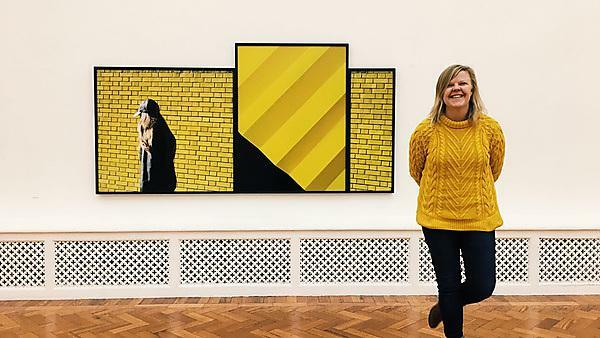 My aim was to not stop doing things – actively working on exhibitions and events since my undergraduate degree has led to all sorts of opportunities. I think it’s fair to say that money has never been a reason to pursue this career, and it would be wrong to expect otherwise! The art world can be tough; freelance curators rely on funding applications in order to pay themselves for their work. A lot of curators are freelance writers or lecturers in addition to their curatorial practice. My assistant curator role is part-time, and the rest of the time I am an Associate Lecturer for the Art Theory and Practice department at MMU. I love the opportunity to teach (and the additional income!). There are a few significant exhibitions that I am particularly proud of: the most exciting and substantial in scale was Jim Lambie’s The Strokes floor installation which covered the entire gallery floor (250 square metres). This was a major project which meant working alongside Lambie’s studio manager and overseeing a large team of technicians and volunteers during the installation process. I also particularly loved installing David Batchelor’s Magic Hour in Pavement Gallery; the beautiful glow of colours from the light boxes meant you could see it from across the park. I think the best thing has been working directly with artists in order to install their works, and I have had the pleasure to meet artists such as Simon Patterson, Mark Titchner, Fiona Crisp, and Torsten Lauschmann. I wish I had started to develop my writing skills at an earlier stage, particularly during my undergraduate, through outputs such as exhibition reviews or artist features. There are plenty of online arts magazines which look for people to write reviews for free. It is a great way to build up a CV of your writing and can lead to paid writing opportunities in magazines such as Art Monthly and Frieze. It’s not too late to do that now (although I don’t have any spare time), but with experience comes confidence. Go for it. There is a lot to say about networking and being in the right place at the right time, but you aren’t going to be there if you don’t get out and see things and meet people. So make sure you attend previews, exhibitions, and events; get to know people already in the field and make sure they know you. Be proactive, get familiar with all the relative organisations in your local area and all the possible jobs you could do. Subscribe to mailing lists and job alerts and keep up to date with these places on social media. I am so grateful for the support I got from the staff at Plymouth University; there were memorable and inspiring lectures, readings, and tutorials that have stayed with me. Doing a joint honours course was tough at times, but it definitely taught me a major life skill in time management and prioritisation! There are too many. I loved getting involved with the Young Explainers at Plymouth Museum and Art Gallery which was offered to Art History students. I was mentored by gallery staff to carry out research and deliver public events and activities for all age groups (a special thank you to Sara Norrish and Adam Milford!). To coincide with the exhibition ‘Joshua Reynolds: The Acquisition of Genius,’ we organised a day full of activities for school children which included playing the role of people from iconic Reynold’s paintings, enacting short performances, and speaking to members of the public in character. I got to wear a wig and see what I would look like with a perm. I worked with my course mate, Frances, to project manage a promotional music event involving local musicians performing in the gallery during the exhibition ‘Writers of Influence: Shakespeare to JK Rowling’ which was targeted at engaging people aged 18-25. We had free refreshments and a quiz, two key factors in drawing the attention of students! I have an awesome group of friends who I met at Plymouth, and speak to almost every day (thanks to WhatsApp). Four of them are now married (two to each other), and I am so proud that they are all excelling in their own careers. We have settled in all corners of the country – Manchester, Worcester, Bristol, London, Oxford, and Cardiff, but we reunite as much as possible (usually at a wedding and soon it’ll be christenings, I expect). I saw two of my old housemates the other day who have both been travelling the world for the past four years and it was so great to see them, and to realise that none of us have particularly changed! I love following what some of my lecturers are up to these days and really keen to keep in touch! Easiest question: yes! Plymouth is located in a beautiful part of the country and I was so grateful for having the sea on our doorstep. The campus itself is right at the heart of the city and it certainly fulfilled the student night life (of which I sampled regularly). I have zero regrets about the course and wish I could just do it again. I am currently teaching first, second, and third years as an Associate Lecturer, and I am constantly reminding them how quickly the three years go! Make the most of everything. Work in your studio space because it’s unlikely you’ll ever find a warm studio again. Pick your tutor’s brains. Keep your head down and on top of your work, but also let your hair down from time to time. Enjoy your time as a student and try not to spend your time worrying – because you want to have good lasting memories. Learn more about BA (Hons) Fine Art and Art History. For more information about our range of courses within the School of Humanities and Performing Arts, please visit the school page. If you would like to find out what other alumni from the Faculty of Arts and Humanities are currently doing, please visit the art, design, media and performance interest area.